When you captivate the attention of your audience, they become prospects and in time stay faithful customers to your brand. This is the single most important intention for a tiny but mighty enterprise when you talk about digital marketing. How do we make our audience pay attention to us (forEVA....)? It’s not an item you check off your to-do list. It’s quite literally an on-going conversation you’re having with your soon-to-be customers. Digital marketing is like a 10x prized show pony YOU MUST GROOM. And she's a fussy little thing. Remember when iPhones could bend in your pocket? iPhone wants you to forget but KitKat turned savage when they used the trending #iPhone6Plus fiasco to win attention. Sharp brands don’t disrupt their audience’s experience online. They join conversations that are already happening instead. They make themselves relevant during events or newsworthy occurrences as they develop —to draw buzz that is shared by others on social media. The best of the best, social influencers, creatively engage in online conversations related to an existing event to exploit the buzz and reach a wider audience. Don’t be the brand who only post content but never interacts with a comment or a re-share. By continually monitoring social media conversations and responding to questions and discussions as they occur —you become known as a worthwhile brand deserving of attention. It’s an effortless route to go viral. Using Twitter during one of your favourite TV shows gets you in front of the conversation. Just like joining a Twitter chat via a popular brand can help you gain new followers. Otherwise known as, influencer marketing; it has snowballed over the last few years, companies seek out partnerships that add additional value through complementary promotional offers to provide their customers. The intent is to form a Big Brother alliance between brands that will increase business for both parties. It’s a cheaper and an alternative way to advertise a product/service that could not have triumphed if done solo. This method is rooted in the concept that brands with similar customers but different distribution channels can combine marketing efforts to build brand awareness and incremental revenue streams. An example of effective partnership marketing is the Cineplex movie theatre and the Scotiabank debit card with their Scene loyalty rewards program. Copywriters mesh well with Web Designers, as do Photographers to Stylist. Not an ad. This is an example, so that you don’t think I’m making this up. Who can you team up with that has a similar audience to yours? Free metric platforms such as Google Analytics and Talkwalker, allow for robust data at your fingertips. Now that digital technology is all the rave, it’s prompting an influx of data collector tools due to its ability to capture the temperature of the internet. It can track and measure the origin of your online sales —which is critical if you want to make more and consistent online sales, darling. You can also monitor website interactions such as unique/returning visitors, time on site, page views, newsletter sign-ups and if they ever downloaded the lead magnet you worked so hard on. BUT, you want to know what else is super valuable?! Pinpointing what captures your audience’s attention then doubling down on it. Here is your chance to implement the data unearthed for sleek customer personalization and experiences using tools, such as messenger chatbots, website copy and email campaigns. Analyzing the metrics and analytics is the advantageous part of marketing that a lot of people like to fast forward, but this will save you the headache of wasting your time on things that have a success rate of zero. This is essentially, mixing smart thinking and technology to gain actionable insights that can help you make better business decisions and connections. I am challenging you to use metrics and analytics today to master epic customer relationships. The popularity of one particular social network can rapidly change due to the ease of how often we swap platforms. However, the most popular social networks to date are Facebook, YouTube, Twitter, LinkedIn, Instagram, and Pinterest with numerous other niche social networks (i.e. Behance, Reddit, Soundcloud). Facebook for setting up messenger chatbots. Twitter for real-time microblogging. LinkedIn for the vast professional network. YouTube for publishing vlogs. Instagram to tap into influencer marketing. Pinterest for displaying visual content. 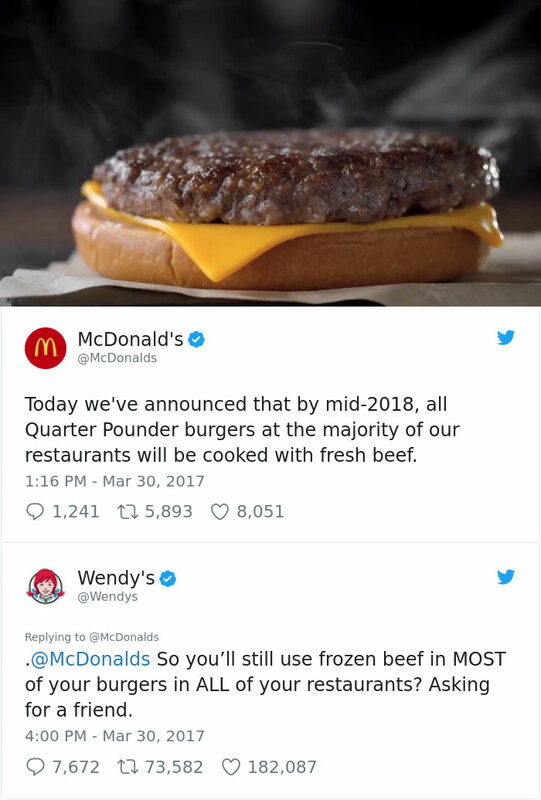 As a prime example of how one brand, Wendy’s (the fast-food restaurant), has mastered the way they win attention online. They’ve been in rap battles with direct competitors, released a mixtape on Soundcloud and trolled McDonald's over their fresh beef claim. They spend the majority of their time replying to customer questions and inquiries on fast-food dilemmas. Very rarely do they post about their product directly. Instead, they crack jokes or share quotes in reference to their products. You see, whether we like to admit it or not, social media possesses countless access points to our audience. We can mine data and work real-time marketing by viewing the hashtags trending for the day and inserting your brand into the conversations popping up on your timeline. Have you ever created whitepapers, e-books, infographics, how-to-videos, blogs, webinars, newsletters, case studies, and or published events? Then you’ve also shared your expertise and or brand material which are all designed to inform and engage your audience. When you create such content tools, it is more easily found through search engines to bring the masses to your website. Many B2Bs use this approach to attract new customers by promoting their know-how through these communication forms. If you’ve done this well, people not only stay on your site longer and explore but they’ll return for more fresh insights from your brand. This is a prime opportunity to optimize content that pulls in the most traffic. Ah ha! Analytics and metrics sneaked its way back into our one-on-one chitchat. Google Analytics can direct you to the content that excels, which means it’s a giant flashing red arrow to the content that requires a strong call-to-action —initiating the customer sales cycle. This is what marketing is built on! Turning the ballooning attention and engagement into something customers can sink their teeth into. There are a few clever tactics I’ve seen online that will help you stand out. In particular, YOUR MUG ON VIDEO (now, I'm a writer, and we don't need such publicity)...nonetheless, your brand can benefit from using any social media platform to shoot behind the scene TMZ exclusives, share stories and your expertise. The 5 attention-attraction factors to help you stand out online. Truly, the fundamentals of digital marketing for 2019 and beyond.